Punk Jews DVD Release Party @ Drom, with Breslov Bar Band and Moshiach Oi! Cover: $10 includes a copy of "Have No Fear!" Special guest - comedian Marc Weiner! This Jewish music revue is for everyone, and features popular Jewish and Israeli music favorites, in English and Hebrew, about Jewish unity, Israel solidarity and the dream of peace. The spirited and spiritual performance will move you from start to finish. Music by jewishmusician.com under the direction of Binyomin Ginzberg. Featuring the voices of Avy Schreiber, Dave Matkowsky, Sean Altman, and Jordan B. Gorfinkel. Voices For Israel gives a portion of their proceeds from the concert to benefit Israeli victims of war and terror. Admission: $25 in advance, $36 at the door. $10 student. From melancholy midnight meditations to funky/punky affirmations of the One, the "Breslov Bar Band" explores musical expressions of the Breslov Chassidim from the traditional to the contemporary. Featuring Pey Dalid, Yehuda Green, Eitan Katz, Chaim Kiss, Eli Kranzler, Yisroel Williger, and more! This event will likely sell out - advance purchase is recommended. A special concert to celebrate the release of Poykler's Shloft Lied, the debut CD by Matt Temkin's Yiddishe Jam Band. This 7-piece band of all-star musicians explores the correlation of large combo Jazz and Klezmer music. Matt and his band are influenced and inspired not only by legendary Klezmer performers Dave Tarras and Sammy Musiker, but also by musicians as diverse and unique as Count Basie and James Brown. A community-wide night of song and prayer. Coffee and cake will be served at 9:00 pm, folowed by a kumzits at 9:30 pm with inspiring words and music from Rabbi Seth Nadel and friends. Featuring Binyomin Ginzberg on keyboards. Selichot in song at 11:00 pm. Sponsored by Agudas Achim, Chabad House of Greater Hartford, Beth David Synagogue, and Young Israel of West Hartford. Come join us for a fun-filled day for all ages! Proceeds will be shared between Yavneh's Scholarship Fund and Project EZRAH. Bring the whole family for a day filled with rides, games, prizes, food, and more. Featuring music by Binyomin Ginzberg and jewishmusician.com. Two sessions exploring traditional Yiddish dance, part of the 2008 Uriel Weinreich Program in Yiddish Language, Literature and Culture at New York University.Featuring dance ethnographer Jill Gellerman and live music by Binyomin Ginzberg. 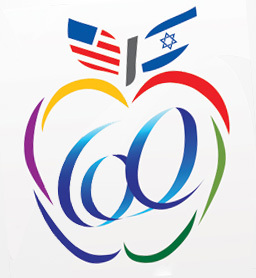 Join us in celebrating Israel's 60th birthday at the Salute to Israel parade! Jewishmusician.com will be playing classic Israeli rock on the Bunk1 float, stepping off at about 1:15 pm. For more information about the parade, visit www.salutetoisrael.com. Ohav Sholom's Annual Purim Celebration will follow Megillah reading. Come in costume! Get ready to dance! Featuring live music by Binyomin Ginzberg. Catered by Smokey Joe's Barbeque. For men, women and children - come celebrate Purim at the Kollel's home away from home! Featuring music by Binyomin Ginzberg. Stop by and pick up a copy of “Purim Sameach” in person! Refreshments will be served. How can Yiddish tants lid text be a source of instruction and inspiration for our steps? Join dance ethnographer Jill Gellerman and vocalist Paula Teitelbaum on the dance floor and find out, as we sing A Yingele A Maydele, di Mezinke and more popular melodies to enliven a rich movement repertoire. Live music provided by an all-star powerhouse band led by Binyomin Ginzberg. For more information, visit http://www.livingtraditions.org. 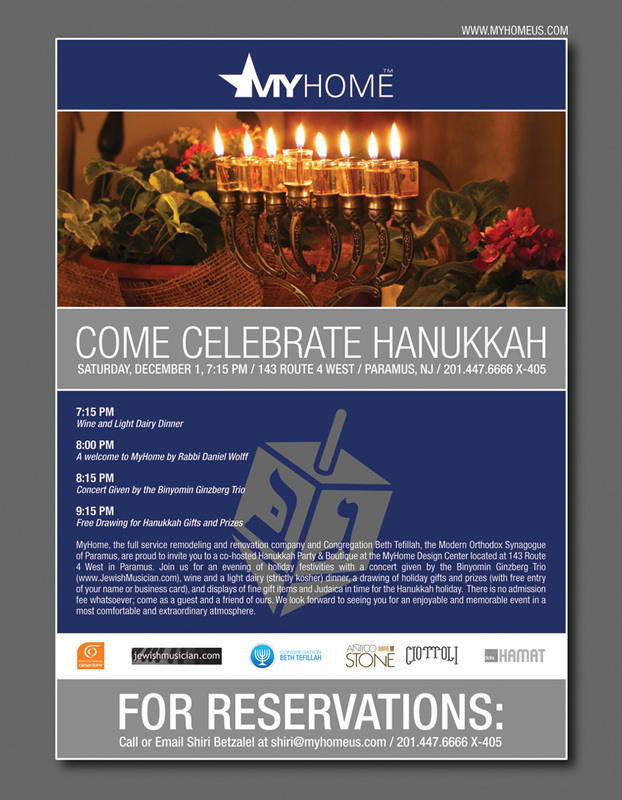 MyHome, the full service remodeling and renovation company, and Congregation Beth Tefillah, the Modern Orthodox Synagogue of Paramus, invite you to a co-hosted Hanukkah Party and Boutique at the MyHome Design Center, located at 143 Route 4 West in Paramus. Join us for an enjoyable evening of pre-holiday festivites (including displays of fine gift items and Judaica in time for the Hanukkah holiday) in a most comfortable and extraordinary atmosphere. There is no admission fee. For reservations, call Shiri Betzalel at (201) 477-6666, ext. 405, or email shiri@myhomeus.com. Live music with Binyomin Ginzberg (keyboards) and Stephanie Kurzman (violin). Come to Dag Hammarskjold Plaza to protest against Iran's President Ahmadinejad, his nuclear ambitions, and his message of anti-Israel propaganda and Holocaust denial. Live music will be played by Binyomin Ginzberg on keyboards, Mike Cohen on saxophone and clarinet, Rabbi Sol Strassberg on trumpet, and Shmuel Ziegler on drums. For more information contact Conference of Presidents at 212-318-6111 or info@conferenceofpresidents.org or the JCRC at 212-983-4800 x 161 or info@jcrcny.org. Join the KRA congregation from 9:45 PM - 10:45 PM, as everyone is invited to write a letter in the new KRA Sefer Torah. Then, at 10:45 PM, celebrate the dedication of the Torah with vocalist Benny Amar and Binyomin Ginzberg (keyboards and backup vocals), to be followed by selichot and a festive dessert reception. For more information, visit http://www.rayimahuvim.org. Special guest Binyomin Ginzberg joins a world-class staff at the Yiddish Summer Weimar Festival in Weimar, Germany, coaching musicians and serving as bandleader for Modern Orthodox simcha repertoire. For more information about the festival, visit the Yiddish Summer Weimar 2007 website. Christian Dawid (Berlin) will coach traditional Yiddish dance music (freylekhs, bulgar, sher, etc.) and Social dances (Pas D’Espagne, Karapyet, Korobushka, etc.) Binyomin Ginzberg will coach Modern Orthodox repertoire, a repertoire that evolved in the New York area over the last 40 years combining Yiddish, Israeli, Khassidic, and pop music. Other faculty musicians during this workshop include Aaron Alexander (New York, drums), Alan Bern (Berlin, accordion/piano), Stuart Brotman (Berkeley, bass/brass), and Sanne Möricke (Berlin, accordion). This year’s workshop will explore the evolution of Yiddish dance in the USA from its Old World origins in traditional freylekhs and shers through bulgars and modern social dances to the post-war developments of Modern Orthodox music and dance, a surprising repertoire combining Yiddish, Israeli, Khassidic and pop music elements. We are delighted to have with us Andreas Schmitges (Germany, traditional Yiddish dances), Erik Bendix (USA, social dances), and to introduce for the first time in Weimar Jill Gellerman (USA, Modern Orthodox) to teach a repertoire that is guaranteed to change how you think of Orthodox Jewish culture! As always, all dance classes are accompanied by live music played by some of the leading Yiddish dance musicians in the world today, and in addition to morning and afternoon teaching sessions the evenings are dedicated to free dance sessions with music. Join us in supporting Israel at the Salute to Israel parade! Jewishmusician.com will be playing classic Israeli rock on the Bunk1 float, stepping off at about noon. For more information about the parade, visit www.salutetoisrael.com. A celebration of Klezmer and Yiddish music with a dash of traditional Israeli music as well. Featuring Binyomin Ginzberg (keyboards and vocals) and Matt Darriau (woodwinds). The Binyomin Ginzberg Trio will be playing the community chagigah at the Young Israel of Scarsdale. The program begins with mincha at 7:30, followed by ma'ariv chagigit with live music. Refreshments and dancing to follow. Join the Carlebach Shul chevra as they celebrate with their Baal Tefillah, Yehuda Green, at the release party for his debut CD, “Land of Your Soul.” Featuring live music by Binyomin Ginzberg. Special preview show in preparation for A Match's first North American tour! Includes a four-course gourmet meal, tax, tip, contribution to the Yad Eliezer Simcha Fund (weddings for the needy in Israel) and, of course, as much participation in the wedding as you like! Featuring live music by Binyomin Ginzberg. Come join the Purim party at East Hill! Fun for the whole family. Featuring music by Binyomin Ginzberg. Refreshments will be served. Ohav Sholom's Gala Purim Bash will follow Megillah reading. Come in costume! Get ready to dance! Featuring live music by Binyomin Ginzberg. In response to this tenuous period marked by unemployment amongst Gush Katif evacuees, and the continued fatalities and emotional strain felt by the citizens of Sderot, Ohab Zedek comes together to help provide financial assistance to our brethren who seemingly have nowhere else to turn. Join your friends for wine and dessert, a raffle, and a live musical ensemble performing jazz-inflected arrangements of classic and contemporary Israeli songs, featuring Binyomin Ginzberg on keyboards, Stephanie Kurtzman on violin and Jeff Ausfahl on guitar. All proceeds go directly to the evacuees of Gush Katif and to Yeshivat Hesder Sderot. Presented in conjunction with Tikvah for Israel. Sponsored by: Columbus Wines and Spirits, Darna, Tomer Gourmet Cookies and Catering, 4kosherwines.com, and Abarbanel Wines. How did the Alleycat become Rom’mu? How is Rock Around the Clock related to Rashi’s Niggun? Join dance ethnographer Jill Gellerman in a spirited romp to song and simcha dance hits from post-war America to the present, as she introduces video examples of the adaptation process and moves through more advanced-level choreography. Live music provided by an all-star powerhouse band led by Frank London and Binyomin Ginzberg, with Mark Rubin on tuba and bass, Michael Winograd on clarinet, Dan Blacksberg on trombone, and Matt Temkin on drums. Join Rabbi Naftali Citron, Allan C. Schwartz, and Sofer Yitzchak Hassine as The Carlebach Shul begins writing their new Sefer Torah. The evening will include Chanukah candlelighting, latkes, martinis, and live music by Yaakov Dov Miller, Binyomin Ginzberg and violinist Stephanie Kurzman, and musical guests. Performers include: singer/songwriter SETH GLASS, rock band YAAKOV CHESED, singer/songwriter BINYOMIN GINZBERG, improv group LOST TRIBE, singer/songwriter RICH MANSUR, songs from rock musical SOUL SEARCHING, and your host, comedian SAMMY 'DEUCE' KASSIN! Featuring BASYA SCHECHTER of PHARAOH'S DAUGHTER. Special guests: ROCKING CHAIR, featuring YANIV TSAIDI (lead singer of HEEDOOSH) and AVI HOFFMAN (lead guitarist of BLUE FRINGE). For info and advance reservations, please email Info@BlackBoxE.com or call (212) 966-7141. Brought to you by The Jewish American Performing Arts Project (in association with Synagogue for the Arts, Howard Teich, Cecelia Margules, and Black Box Entertainment). Come join us for a fun-filled day for all ages! Yavneh Academy presents a carnival to benefit Israel. Bring the whole family for a day filled with rides, games, prizes, food, and more, including a rock wall and petting zoo. Featuring music by Binyomin Ginzberg and jewishmusician.com. For reservations, please contact Yavneh Academy via email. Come commemorate Yom Hazikaron, beginning with Mincha at 7:30 pm, and stay to celebrate Yom Ha'atzmaut! Featuring music by Binyomin Ginzberg and jewishmusician.com. Refreshments will be served. For men, women and children - come celebrate Purim at the Kollel! Featuring music by Binyomin Ginzberg. Stop by and pick up a copy of “Purim Sameach” in person! Refreshments will be served. Chaim Dovid, Binyomin Ginzberg, Yaakov Dov Miller, and other musical guests will be performing a pre-Purim concert. Come hear new songs and classic favorites with Chaim Dovid and friends, continuing the tradition of quality Jewish music at the Mount Sinai Jewish Center in the Heights. Brought to you by Isralight. Uncle Moishy & The Mitzvah Men!! Englewood Synagogues invites all to see Uncle Moishy and the Mitzvah Men! 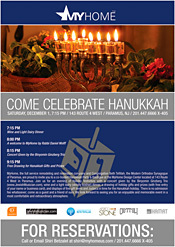 Binyomin will be playing keyboards with the Mitzvah Men at this event. Brought to you by the Englewood Synagogues. Catch The Binyomin Ginzberg Trio live in concert! In the spirit of the season, The Binyomin Ginzberg Trio will be performing “Funny, you don’t sound Jewish…” featuring the original versions of Jewish songs you thought you knew, including Basque folk, German and Turkish pop, Andrew Lloyd Webber, classic rock, pop hits by Men At Work, Chris De Burgh, Pet Shop Boys, and much, much more. The Trio will also be performing selections from their critically acclaimed album, “Purim Sameach.” Purim Sameach gathers together Purim tunes from around the world, from contemporary Jewish folk rock to Klezmer melodies to traditional Israeli songs. The event is brought to you by the OU Singles Connection. Fee: $20 in advance, $25 at the door.